I always say, nothing beats a good tip. I seem to be building an endless mental collection of handy jewelry-making tips, and once in awhile I find so many in one spot, I have to share! 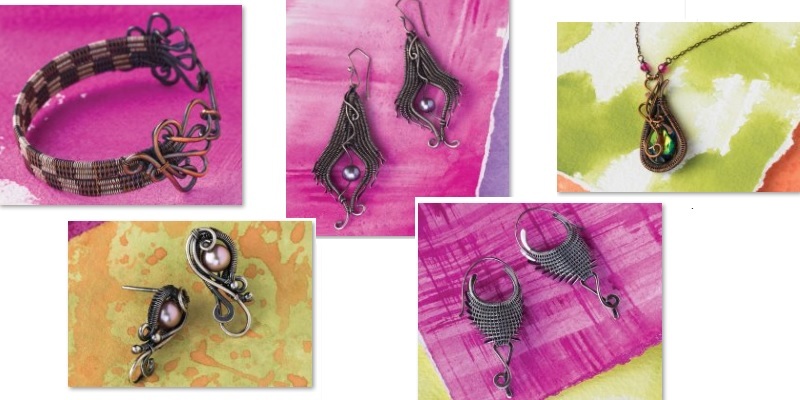 That’s the case today, with wire jewelry making tips in Sarah Thompson’s top-rated book, Fine Art Wire Weaving. “Before beginning the projects, develop good habits,” Sarah writes. 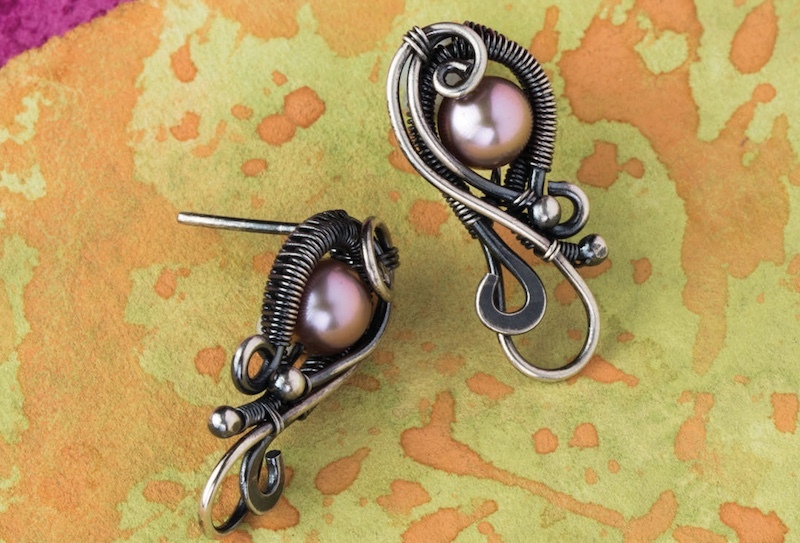 “This will lead to a higher level of craftsmanship, and the careful attention to details, precision and consistency will set your jewelry apart.” Good tips lead to good habits, so below are some helpful wire jewelry-making tips excerpted from Fine Art Wire Weaving, all by Sarah Thompson. Your hands are the best tools you have. They tend to be underappreciated and underused. Resist the tendency to always grab for a tool to do the work; your fingers can do a much better job. Remember to take breaks frequently and stretch your hands. Letting the wire run along your fingers can cause chafing. Use pliable fabric tape to create a buffer between your fingers and the wire. Fabric tape does not restrict movement in your hands. Preventing kinks eliminates potential weak points in the wire where it’s most likely to break. Stop the kinks before they start by being mindful of the wire. If you see the wire looping onto itself, take the time to stop and unloop. The wire can uncoil off the spool faster than you can work with it, causing it to tangle. To prevent this, place the spool on the floor while you are working; this stretches the uncoiled wire so it does not tangle on itself. Tip: If your wire came in a coil, take the time to wrap it around a spool or bobbin before working on a project. When purchasing the wire, request it on a spool. Another option is to use a container just wide enough to hold the spool upright. The spool will spin freely as you work, but not completely uncoil. This can also be done with multiple spools in one container. Holding the base wires can make your hand fatigued and cramp up. A ring clamp fits comfortably in your hands and grips the wire without marring it. Readjust your clamp frequently so that no more than ½-inch (1.3 cm) of the weave is above the clamp. Note: If too much weave is exposed, when you compress the unsupported woven strip it will buckle. Dowels and round-nose pliers can be used as mandrels to help you create consistent loops in the wire before further shaping, as in the Kayla Pendant (above). Position the round-nose pliers where you would like to make a large loop, leaving the round-nose pliers open. Grip the end of the wire with your fingers and wrap the wire around the jaw of the round-nose pliers. Remove the pliers and continue to shape the rest of the wire with your finger. Use coiling to hide the fact that you’re trying to get from point A to point B to secure the wires together. When coiling, wrap tightly and frequently compress the coil with your fingers. It’s easy to overlap the coils or create uneven spacing, giving the coil a sloppy look. Slow down so that if a mistake happens, you can easily go back and fix it. Mistakes are just new designs waiting to happen. Some of my favorite designs were complete failures that took a new direction. It’s an opportunity to step back, think outside of the box and get very creative. I find I become more adventurous in my designs when mistakes happen. It’s already ruined, so why not go extreme and see what becomes of it? The worst that could happen is that I have to start anew; the best is that I end up with an amazing design. For me, that possibility is worth it. At the very least, it is an opportunity to learn and grow. 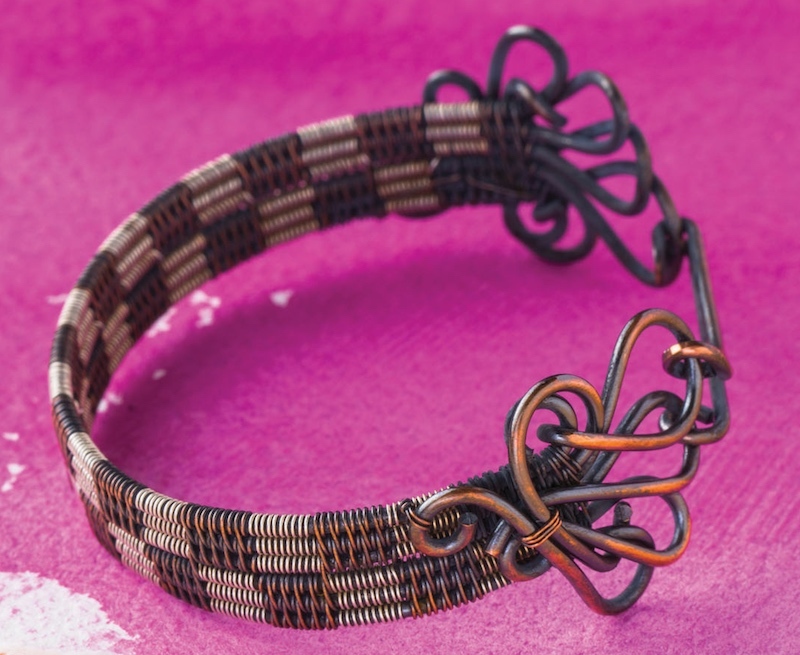 In addition to these insightful tips from a leading master jewelry designer, Sarah’s resourceful book (and the online workshops adapted from it) will give you access to 20 stunning wire weaving jewelry projects. 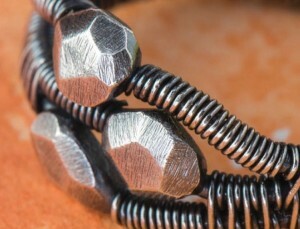 What better way to learn the techniques, tips and tricks of wire weaving than from an artist who has perfected it? You’ll learn essential wire jewelry-making techniques and best practices to use in your own designs, like how to make faceted ball ends on wire (left), how to create a checkerboard effect with two colors of wire, and troubleshooting. Sarah guides you through how to get consistent weaves with perfectly even wirework, how to fix mistakes and continue when wires break during a weave, how to achieve symmetry in your designs, and more. “My goal as a teacher has always been to give the students a strong foundation from which they can then begin creating their own original designs. Each of my classes was created with this goal in mind; breaking down the techniques and specific design elements so that they can be learned in a manageable manner,” expresses Sarah. 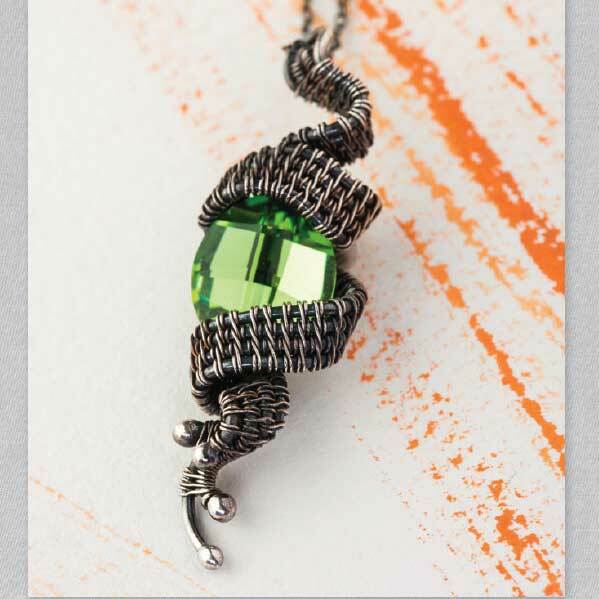 Get Sarah Thompson’s wire weaving book Fine Art Wire Weaving in print or digital format! If you prefer a more interactive learning experience, learn wire weaving with the online workshops adapted from Sarah’s book. 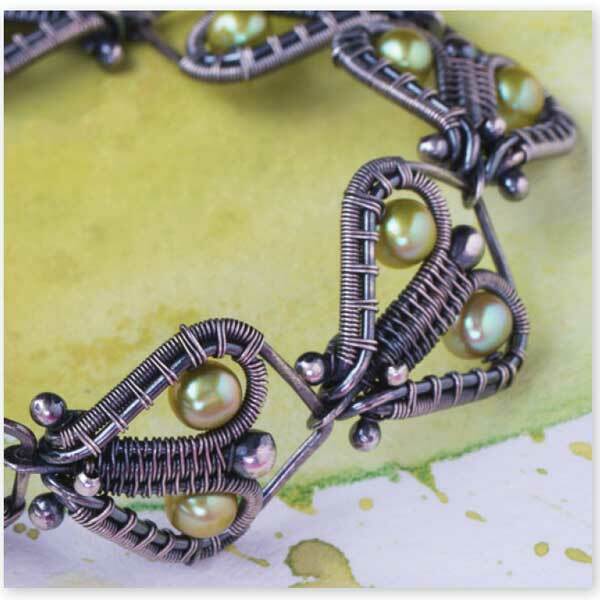 Start with Fine Art Wire Weaving: Getting Started, followed by the intermediate workshop, and finish with the advanced course. 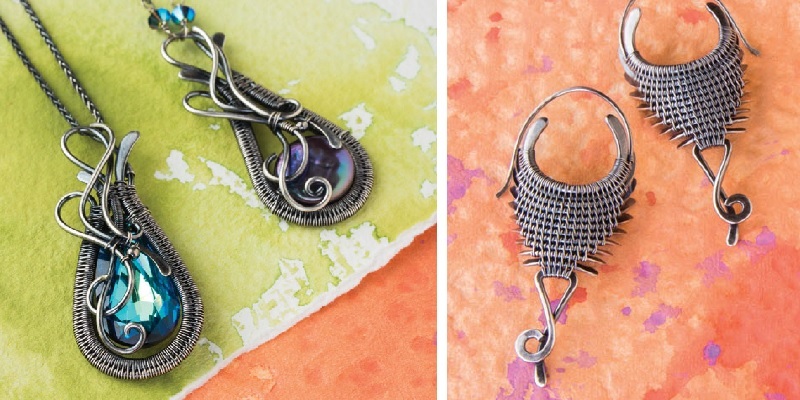 Learn wire weaving and other wire jewelry techniques from Sarah Thompson’s books and online courses!